From September 6 through October 18, 2008, EFA Project Space invites you to IN RESIDENCE: Recent Projects from Sculpture Space, an exhibition celebrating the cultivation of the creative process and the crucial contribution organizations such as Sculpture Space (Utica, NY) provide to artists. Curated by Christa Erickson and Patterson Sims, this exhibition provides a sampling of work by artists who have recently participated in Sculpture Space’s residency program. a parallel dimension: from Jae-Hi Ahn’s, glistening gem-like hanging vines; to Hairpiece, a dizzying installation of wound synthetic hair by Las Hermanas Iglesias; to Beth Krebs’ magically spare illusionary room; to Abe Ferraro’s Climbing Machine video documentation of an elaborate construct which generates drawings as the artist climbs; to Jina Valentine’s meticulous and destructive transformation of herbal remedy boxes; and finally, to Sterz’s strange, unearthly floating object mirrored in an acrylic puddle on the floor. 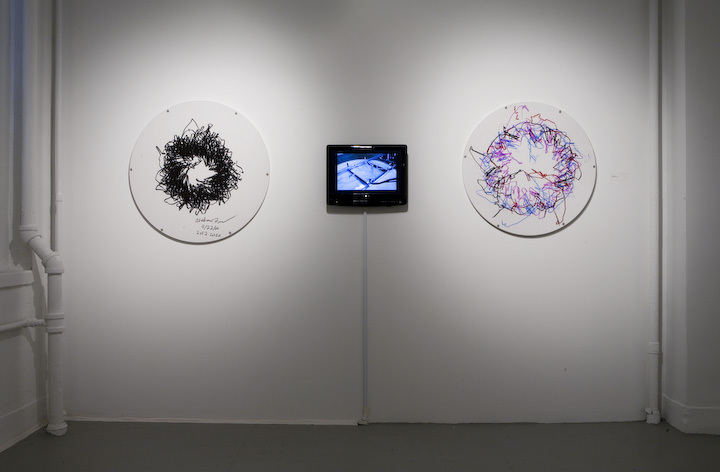 By partnering with Sculpture Space on this exhibition, EFA Project Space begins to fulfill its goal to provide a unique space for collaboration with other art and cultural organizations, thus expanding audiences for the arts while bridging gaps in the art community. Light sensitive device consisting of 4 individual unites each containing a leaf, a photo-resistor, and a servo-motor.